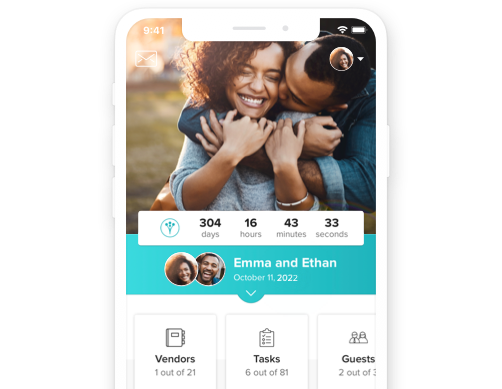 Easily share details with guests. Set up your free website in minutes on WeddingWire. Simply choose your favorite (free!) design and add your event details. Easily personalize your website by choosing a design and adding your wedding details. Make it easy for guests by linking your WeddingWire Registry to your website. Guest responses on your website will automatically sync with your Guest List. Share hotel details and unlock special rates for your guests. I've been using the website on WeddingWire, and it's easy to customize, and the online RSVP page makes it really simple to track which guests can and can't make it. The wedding website that is free and totally customizable, that allowed for rsvp's, seating chart, and guest lists, is WeddingWire! I have been using WeddingWire's website in order for my guests to RSVP. I have loved how easy it is to have them RSVP for all the wedding events in one place. One of the first steps in the wedding planning process is building a free wedding website on WeddingWire. We make it easy to include all your wedding information, and our designs are also customizable. You can build a wedding website that reflects your personality. Choose options based on color palette, style and invitation design; and create a custom backdrop with an engagement photo, personal artwork and more. These personal touches will help bring your wedding website to life. What’s in a name? Everything! We want your wedding website URL to be personal — match it to your wedding hashtag or just stick to your first names. Either way, you get to decide.